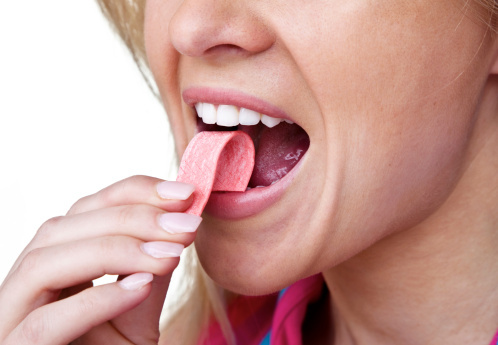 Did you know that 374 trillion sticks of chewing gum are made each year and the average person chews 300 sticks annually? Something else you may not know is that chewing gum has been found to yield a wide range of health benefits that go beyond just preventing cavities. So whether you chew it for its flavor, its breath freshening effects, or simply because you are bored, you can now take pride in the fact that you are also enhancing your health and preventing certain health problems. A team of researchers at St. Lawrence University instructed 159 students to solve difficult logic puzzles as well as a variety of other mentally demanding tasks. Half of the students were given sugar-free gum to chew on during the tasks, and the other half were gum-free. The gum chewers performed significantly higher on 5 out of 6 of the tests. Another study conducted at Cardiff University found that chewing gum helps people to be more attentive and increases reaction time in stressful situations. Finally, chewing gum has been found to increase concentration, memory performance and overall academic performance. Chewing gum can helps to reduce emotional health problems such as tension, anxiety, frustration and stress. In fact, the U.S. Armed Forces have been giving its soldiers chewing gum ever since World War I as a tension relief method. Thanks to advertising campaigns from companies such as trident, the fact that sugar-free chewing gum helps prevent cavities is no secret. But did you know it can also help prevent a range of other dental health problems? The act of chewing helps to increase the flow of saliva, which washes away acids from food and thereby helps to protect the enamel of your teeth and keep them strong. Chewing gum also helps to prevent the build-up of plaque and preliminary evidence suggests that it may help prevent gingivitis. Gum can also help to whiten teeth, and it is beneficial for people who suffer with Xerostomia syndrome (chronic dry mouth). Researchers in Iran developed a chewing gum with medication in it that helps to cure symptoms of motion sickness such as dizziness, nausea and vomiting. The biggest benefit of this gum over other motion sickness medications is that other medications need to be digested before they provide relief, and that takes time. With medicated chewing gum, the dimenhydrinate (the active ingredient in many motion sickness medications), is absorbed through your cheeks and then directly into your blood stream, so you experience much faster relief. RELATED READING: 10 Ways to Rejuvenate Your Brain at Any Age!